Kinghorn Lifeboat Station: Welcome to Kinghorn Lifeboat Online! 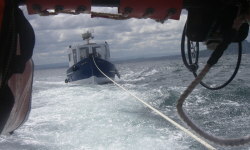 Welcome to Kinghorn Lifeboat Online! Kinghorn RNLI Lifeboat?s volunteer crew was called out just before noon on Sunday following a distress call from two kayakers 2 miles off Longniddry. Click the button to send a donation directly to our station! Kinghorn Lifeboat Station is an RNLI funded and operated rescue station on the coast of Fife, three miles from Kirkcaldy and across the Forth estuary from Edinburgh. We are available and ready 24 hours a day, every single day of the year to assist the MCA (Coastguard agency) in effecting rescues between Elie Ness/Aberlady to the east, and Inchcolm/Granton to the west. In 2015 we celebrated 50 years of saving lives at sea. It was in 1965 that the RNLI first placed a lifeboat in Kinghorn. * RECRUITMENT: WE NEED YOU * Why not volunteer with us and help save lives at sea? You'd be surprised who can do it! See our recruitment pages and crew case studies to find out more. Come and visit us any Sunday morning, Friday or Monday evenings if you would like to meet the crew. Join in the fun activities at Silver Sands, Aberdour - All welcome!